Couldn't I just run on my own? what makes Labellacorsa different than other run programs? Running with a partner provides not only companionship, but also accountability and encouragement to reach your goals. Plus, its a lot more fun to run with new friends! 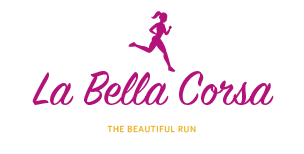 Women encouraging and empowering other women to run is a key component of what LaBellaCorsa is all about. It's a company designed to help women feel comfortable learning to run or trying a new distance. It's a safe and inviting environment to try running. We build up the distance so you can join community running groups when you finish our program. Aren't private coaches designed for elite athletes or serious runners? Everyone, even beginners, can benefit from the accountability and encouragement a personal coach can provide. Running can be intimidating when you are just starting out and I'm here to pass on tips, cheer you on and help you make a lasting lifestyle change. Personal accountability can make you more successful in achieving your running goals, whether that be 5km, your first half-marathon or running for fitness and fun. What do I do when I complete a program? When you finish a 5km or 10km program, you can join a community running group or maintain on your own until another distance program is offered. Through the winter I am available for accountability, personal coaching indoors or private runs outside. I also provide maintenance tips when you finish a program to keep you running.